Pictured above is the handy work of regular North Helpline cooking demonstration volunteer Alisa. We love working with Alisa because of her always upbeat disposition and her problem solving. When our immersion blender was out of commission Alisa got us a new one. 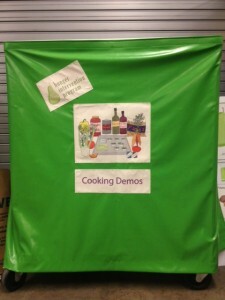 When the piece of paper we used as a table skirt for the cart we cook on was crumbling and wrinkled Alisa handmade us the snazzy sturdy, new skirt pictured here. Now the food we make always tastes great AND we look good cooking it. Thanks Alisa for you energy and creativity. We love you!